In this video I share some tips and suggestions as I show how I handle and transport some of my projects without damaging them. Everybody’s needs are different, but I hope that sharing these tips will help inspire solutions for your needs when handling & transporting projects. Great tips Todd. Good ways to prevent damage. GaryL – I primed the wood first with Kilz and added a little bit of black paint to it to make it grey in color. Just wanting to make it easier to cover with the hammered metal paint rather than painting over white. 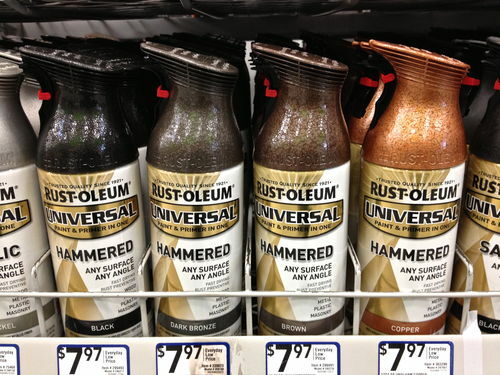 The Rustoleum Hammered Metal Paint is pretty cool stuff and dries incredibly hard. It can be challenging to paint with. It works best to brush it on. Rolling can work but fine “angel hair” will float up off the roller as you apply it. Spraying is a no-go. Coverage over large areas can be challenging to get it to look even. I am using it on a DJ booth project to create a techno look and it is working out great. I’ve used the Rustoleum Hammered Metal Paint on some of my boys school and Scout projects and it does give a cool effect. I’ve always used the spray can. I’ll have to try brushing it. I’m sure that fit the bill for a “techno DJ booth”. GaryL – I have not seen this product in a spray can. The project I am on requires a lot of paint so I doubt I would buy a bunch of spray cans. But I will have to keep an eye out for it on other projects. GaryL – Well, there it sits on the shelf at Lowe’s. Rustoleum Hammered Metal Paint in a rattle can. I had not seen that before. If you looking for headphones or earphones then Gadgetwix is the best website. If you looking for best earphones or headphones then gadgetwix the best website.